and to practice for major tests that can affect the course of your life. A teacher uses tests to determine students’ levels, to find out if they are learning what he or she is trying to teach (and if not to change the lessons until they work!) and to evaluate students for grades or progress to a new level. Quizzes are short tests given often to check students’ understanding, especially of what they have just studied, and find out what needs more practice. When we were in school, most of us disliked tests and avoided them whenever possible. As adults, we need to take advantage of them. A little time spent on a test can save a lot of time later by helping us focus on what still needs practice. Each of the quizzes and tests below includes answers or an answer link. Many of them also link to pages you can study if you find you need more preparation. Most of these quizzes are intermediate level up. Any beginner or advanced quizzes will say that. 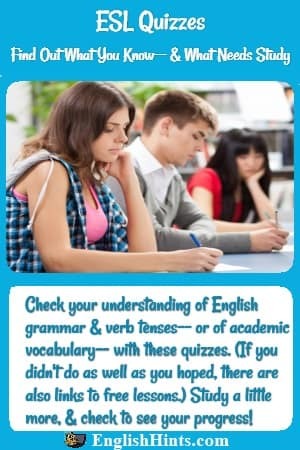 These quizzes (and a larger test or two) can help you learn vocabulary important for the IELTS or TOEFL exams, not to mention university study or professional work. 23.Comprehension Worksheet (a quiz)--TED talk on New Ways of Seeing Cancer. You might also want to try some printable crossword puzzles relating to the same vocabulary. They make a nice break from more formal quizzes. * The quizzes in the Academic Vocabulary section review words from the Academic Word List. They are numbered by newsletter issue to make it easier to find related practice pages. Later issues review some of those words and add other important vocabulary. Home> English Language Test Prep> ESL Quizzes and Tests.